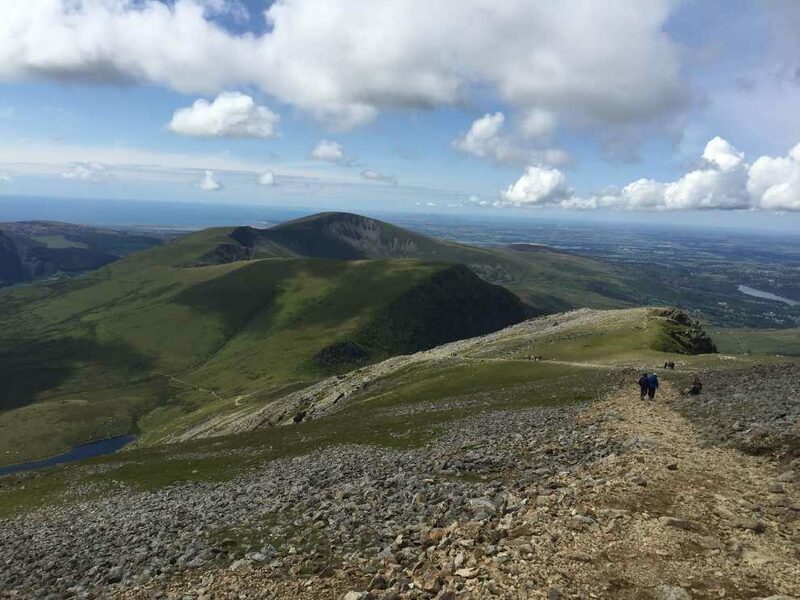 The Snowdon Ranger Path is one of the quieter routes on Snowdon which follows a rocky path up the eastern slopes before joining the shoulder over Clogwyn Du’r Arddu and finally merges with the Llanberis Path for the final stretch to the summit. The Ranger Path offers stunning views over vast valleys, mountain lakes and steep rocky ridges. The Snowdon Ranger Path is thought to be the oldest of the six classic routes to the summit of Snowdon. 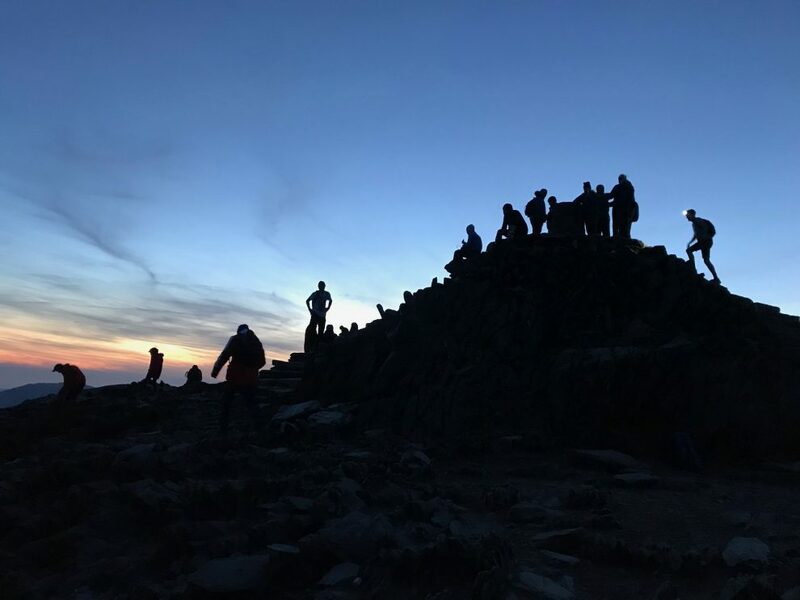 The Path is named after John Morton who was known as the ‘Snowdon Ranger’ and guided Victorian clients to the top of Snowdon in the 19th century. John Morton built a tavern known as the ‘Snowdon Ranger Inn’ which stood on the site where the YHA stands today. This is one of the easier routes on Snowdon and also less busy than the Llanberis Path and the Pyg Track. The route begins in the Llyn Cwellyn Car Park just off the A4085 between Betws Garmon and Beddgelert. Following the signs for the bridleway take the path towards and over the railway track and continue until reaching the farmhouse. Turn right and follow the zigzag path as is meanders through the flat mountainside. After 1km the path splits (SH 573 552). Continue straight-ahead and don’t take the left-hand path which takes you to Llanberis and the route up Moel Cynghorion via Bwlch Carreg y Gigfran. The gravely path heads east for the next 2km gradually ascending through the pasture towards the lake of Llyn Ffynnon-y-gwas on your right. It is at the lake where the path becomes steep and challenging as you ascend the rocky shoulder to Clogwyn Du’r Arddu. Continue along the zigzag path over rocky terrain for the next few hundred metres. The hard work is rewarded with impressive views down in to the lake filled Cwm Clogwyn and across to Llechog and Bwlch Main ridge. 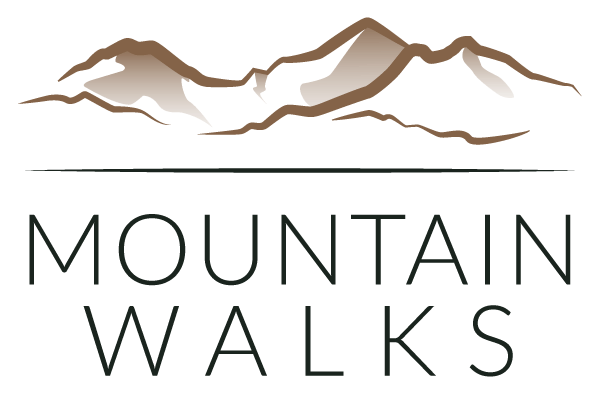 Follow the rocky scree path which is marked with cairns as the route moves away from the ridge (and steep drop of Clogwyn Coch) and starts to flatten out. Although less steep the path is still very loose underfoot. The terrain become very baron so route finding can be tricky in poor conditions. Follow the cairns and stay on the path walking in a south-easterly direction as the route begins to steepen once again for the next 800m. You will reach a large standing stone which marks the path and the crossing of the Snowdon Mountain Railway track. The railway is operational so check before crossing as it may be difficult to see or hear the train in poor weather. Cross the track and after a short walk you will reach the second large marker stone indicating the joining of the Llanberis Path. 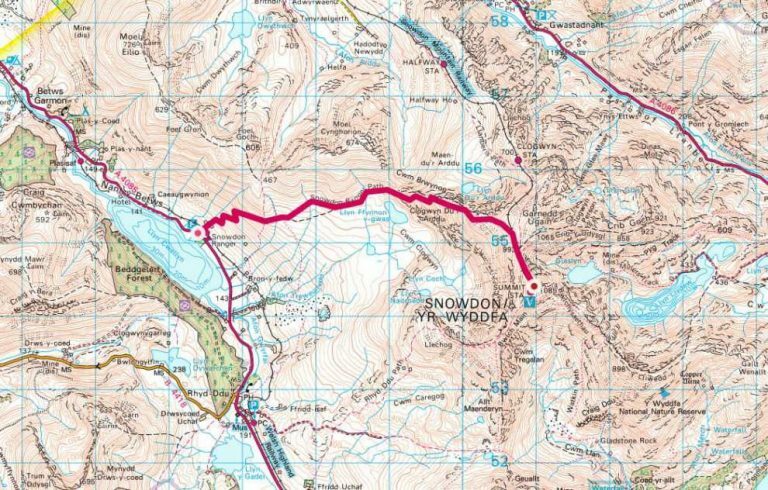 You will be leaving the Snowdon Ranger Path and following the Llanberis Path to the summit. Turn right heading south until reaching the third and final marker stone which marks the joining of the Pyg Track and the Llanberis Path. Keep a mental note of these marker stones as they will be key for an easy descent. The final summit push becomes busy with walkers as three routes (Llanberis Path, Snowdon Ranger Path and Pyg Track) merge for the final few hundred metres to the summit. 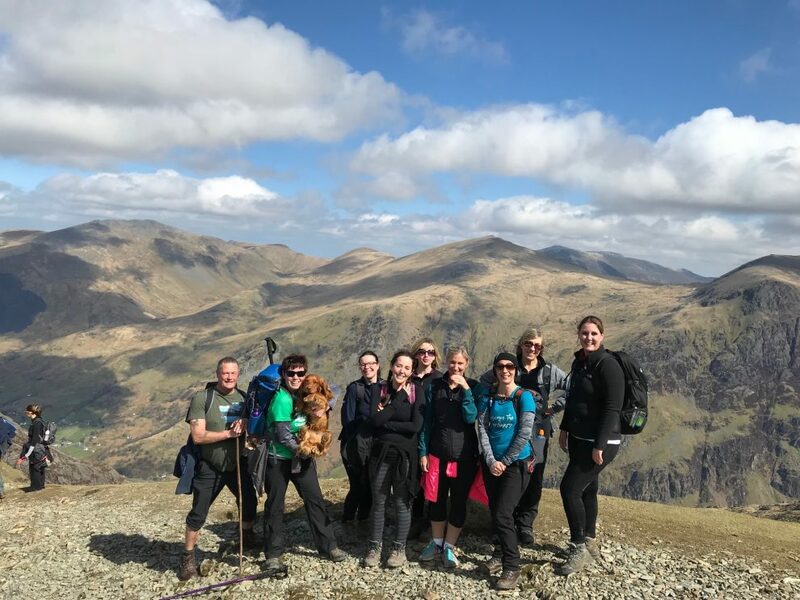 The final stretch offers the most impressive views with the beautiful mountain lakes and the sharp ridges of Crib Goch and Y Lliwedd which make up the Snowdon Horseshoe. 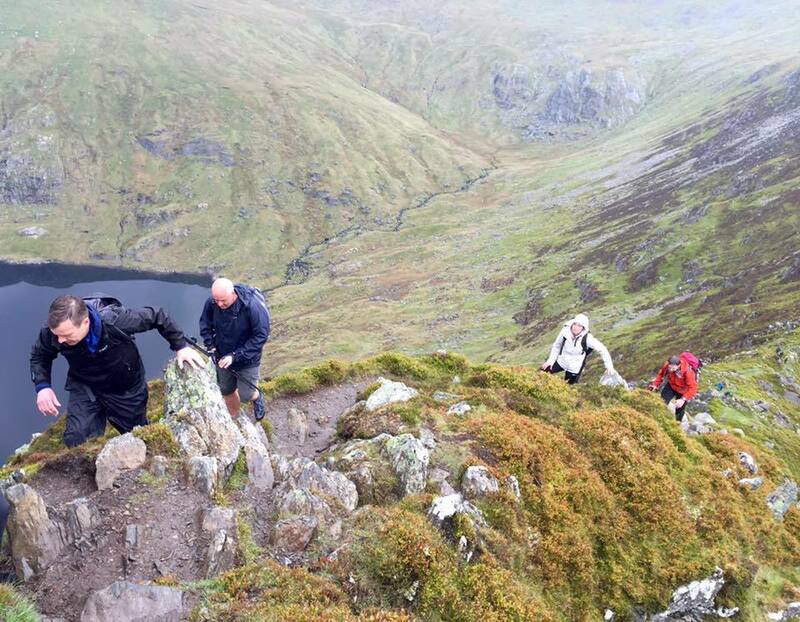 Steps will take you to the summit cairn for the magnificent panoramic views of the Snowdon Massif and Snowdonia. The Snowdon Ranger Path decent follows the exact same route as the ascent. Just ensure that you take the correct route at each of the three marker stones. The first marker stone is the Pyg Track marker. Continue past this one until reaching the second marker stone which indicates the Llanberis Path descent. Take the path which curves to your left (straight on will take you to Llanberis). You will shortly cross back over the railway track. From this point the path is easy to follow back down the mountain to the car park at Llyn Cwellyn. If conditions are poor then the marker cairns will act as a guide and these are easy to find and follow.